the knowledge and understanding of all relevant stakeholders. It also intends to contribute to strengthening the collaboration between all stakeholders supporting the LGBTI refugee community and act as an accelerator of social change. Furthermore, it seeks to support LGBTI refugees & asylum seekers and facilitate the pathway towards social inclusion and integration in Greece. Refugees WelComB! Is a European project funded by Erasmus+. The Strategic Partnership led by Kontakte für Europa e.V. 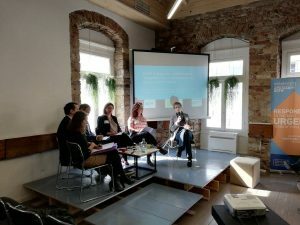 (Germany), brings together seven (7) organizations from Germany, Greece (SolidarityNow), Hungary (Artemisszio Alapitvany), Italy (Associazione InformaGiovani), Spain (Madrid for Refugees), Bulgaria (Ocean Whale), and Turkey (TC Buca Kaymakamligi). The project aims to enhance the social and professional integration of refugees and to improve the interdisciplinary co-operation in this field. In the framework of the Strategic Partnership two surveys will be conducted in the seven (7) partner countries targeting refugees and relevant stakeholders. The findings of the surveys and the integration plans applied in partner countries will be analyzed and shared as best practices. Monthly meetings (grant assistance, Reporting back meetings, meetings with senior management). The above activities will enable the collection of more/better feedback by the SolidarityNow primary constituents, to influence more informed decision making, and will improve the relaying of information about how SolidarityNow is responding to feedback back to its primary constituents. The project, which is funded by the Social Sector Accelerator (on behalf of CIVICUS: World Alliance for Citizen Participation), will be completed in August 2019. SIRIUS is an EU founded project which was launched in January 2018 and will run for three years. 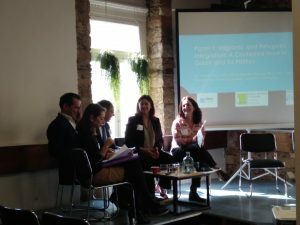 It is consisted of 11 partners from 7 countries and it builds on a multi-dimensional conceptual framework in which host country or political-institutional, societal and individual-related conditions function either as enablers or as barriers to migrants’, refugees’ and asylum seekers’ integration via the labor market. to advance a theoretical framework for an inclusive integration agenda, outlining an optimal mix of policy pathways for labor market integration including concrete steps that Member States and other European countries along with the EU can take to ensure that migrant-integration policies and the broader system of workforce-development, training, and employment programs support new arrivals’ access to decent work opportunities and working conditions. As one of the 3 NGOs involved in the project, SolidarityNow saw this project not only as being great opportunity but also as an important effort because labor market integration is part of what we do through our programs and advocacy efforts. We saw it as an opportunity to better inform our work and services and on the other help us develop more evidence-based research and policy recommendations at the national level. Finally, we recognized the gender- sensitive approach the project is taking, which aligns with how we seek to support women and the additional burdens they face and our goal to reach an in-depth understanding of gender differences. 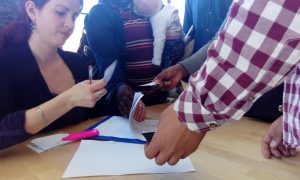 Within the Consortium, we are focusing on the practical implementations of the research findings by hosting a Job Fair in Thessaloniki in spring 2019, and the testing of a Serious Game that employment agencies, migrant organisations and other stakeholders seeking to facilitate the labor market inclusion of recent migrants, asylum seekers and refugees will be able to use. The project entitled “Migrant and Youth Social Inclusion through Entrepreneurship” aims to promote entrepreneurship as a means towards social inclusion and integration. Beneficiaries of the project will include youth residing in the countries of focus, irrespective of their background, who wish to start their own business as entrepreneurs. The closure of the borders and the Balkan route resulted in several thousands of people being trapped in Greece. Among them, the most vulnerable group: unaccompanied and separated children. Even though they are the most vulnerable, these children often do not receive the protection enshrined in European and international law. In order to safeguard the human right to safety and decent living conditions, Faros in collaboration with four other organizations – SolidarityNow, Merimna, CivisPlus and Babel – are launching a program entitled “Following their Footsteps”. 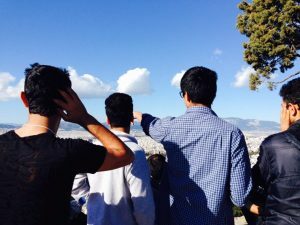 The program aims to strengthen the systematic identification and registration of unaccompanied and separated minors living under difficult conditions in the streets of Athens and the provision of holistic care and hospitality through an alternative to detention or life on the streets. More specifically, the program aims to provide these children social integration opportunities, enhance the effectiveness of the existing support network in Athens and contribute decisively to reducing the phenomenon of absconding from accommodation structures through advocacy for the development of a specific national policy. The project is funded by EPIM (European Programme for Integration and Migration). 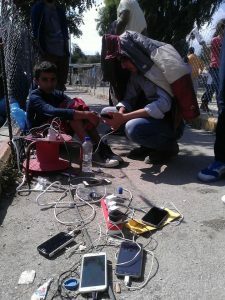 SolidarityNow developed an IT project implemented in Polykastro that provided internet access and connectivity to the stranded population remaining at the EKO gas station following the closure of Greece’s northern border. This program enabled individuals to access information about asylum procedures, as well as provide them the ability to contact their families and friends. The project has been completed and was funded by Care International and Rescue Telecom. SolidarityNow and CARE International (within the START Network), implemented a program that responded to the vital food needs of vulnerable populations, including refugees, asylum seekers, migrants, unemployed Greeks, and any other groups with urgent nutritional needs. Care4Solidarity helped to fill the gap between groups who were in need of food assistance, but were excluded from the relevant public assistance programs. The project empowered these groups by provided cash vouchers directly to them, thereby giving these individuals the flexibility to decide for themselves which food items they wish to purchase to best meet their needs.